I listen to patients and their families to address their specific concerns, and I work in harmony with the hospital’s multidisciplinary clinicians to provide an integrative care plan that is both understandable and agreed upon by each patient and his or her family. Dr. Syed Abutalib, who joined Cancer Treatment Centers of America® (CTCA), Chicago, in 2008, places the care for his patients and their families first and foremost. He believes in creating an atmosphere that facilitates open, honest, three-way patient, caregiver and doctor communication, which is why he is always accessible to his patients and their families. Dr. Abutalib’s care reaches far beyond the walls of our Chicago-area hospital, as he routinely provides patients and family members with his cellphone number to call should they ever need to consult with him. The board-certified hematologic oncologist devotes ample time to each of his patients, empowering them to take an active role in their treatment plan. Dr. Abutalib earned a medical degree from Dow Medical College in Karachi, Pakistan. He completed an internal medicine residency with an emphasis in hematologic malignancies at Cook County Hospital in Chicago. 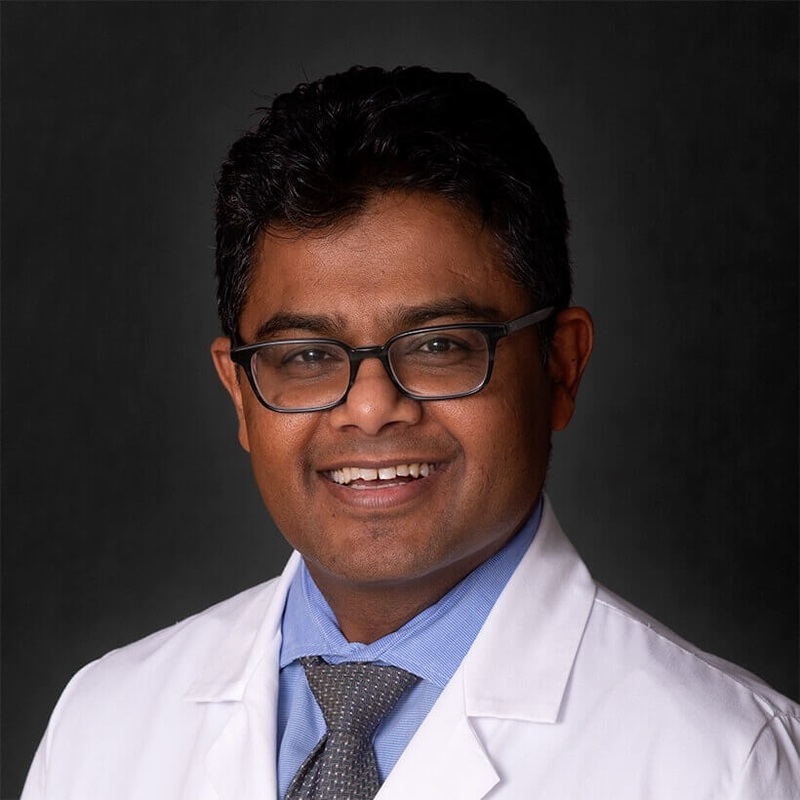 He completed a fellowship in hematology/oncology at the University of Illinois at Chicago (UIC), with an emphasis on blood and bone marrow transplantation. During the same period of time, he was granted permission to pursue his interest in research at Robert H. Lurie Comprehensive Cancer Center of Northwestern University, working with Martin S. Tallman, and at The University of Chicago Medicine Comprehensive Cancer Center, working with Dr. Wendy Stock. While working on his fellowship, Dr. Abutalib voluntarily spearheaded the Thrombosis and Homeostasis conference at UIC, in addition to a variety of other educational projects. As the Assistant Director of the Stem Cell Transplant & Cell Therapy Program at CTCA® Chicago and co-leader for the CTCA enterprise-wide Hematologic Malignancies Cancer Institute, his role has been expanded to assess and deliver well-designed, patient-focused clinical trials to all CTCA hospitals throughout the country and introduce new medical education strategies on a global scale. Dr. Abutalib has co-edited many hematology and bone marrow transplant books and has been published in a number of medical journals and textbooks. Dr. Abutalib is the associate editor for the American Society of Clinical Oncology (ASCO) magazine, The ASCO Post. He is also the reviewer for the journal Blood Reviews and the update editor for one of the leading textbooks, Hematology, Basic Principles and Practice (7th edition) by Hoffman. Additionally, he has presented at clinical conferences and meetings on a variety of topics related to hematologic disease, including the Chicago Lymphoma Society. Dr. Abutalib is an associate professor at Rosalind Franklin University of Medicine and Science, where he is involved in educating and mentoring medical students. He is also an active member of the American Society of Hematology (ASH), ASCO and the American Society of Blood and Marrow Transplant (ASBMT™). He continues to collaborate with other experts in the area of hematology/oncology to explore new medical breakthroughs and treatment options in order to better educate, treat and care for his patients. "Excellent staff and answered all concerns about my condition"
"Dr. A is the best! He is deeply concerned and attentive ti his patients." "Seems very knowledgeable. I trust him with my life." "Doctor A- Blood Cancers was amazing. The amount of knowledge he possesses is impressive. We even received a history lesson on my type of leukemia. That was enough to convince me he knew exactly what he was dealing with. Unfortunately we didn't get to see him for our second/last visit bc he got sick. But I would definitely recommend him"
"Bedside manner has diminished over the two years attending the Zion, IL facility"
"Dr. Abutalib was very thorough explaining my disease. He told me after my testing was over that we would sit down and he would have a plan for my specific situation. After the sit down he once again explained everything that he was going to do and the phase I was in with the disease. I have already recommended CTCA to everyone I have spoken with at my work. I am very impressed with the entire staff." "I have the up most respect and confidence in all my doctors, and I already tell the world about them, not that I have too." "Knowledgeable, approachable. Very clear explanation of treatments and results." "I am a [...] year survivor. My folllow ups are always thorough and efficient." "both of my doctors are fantastic"
"Dr. A is the best." "[...] and Dr. "A" are amazing. My scan revealed some issues after [...] years. However Dr. Abutalib assured me on the spot not to worry and he made the appropriate decision to see me sooner for the next scan. He then said only God will know, hugged me and told me he loved me. No where else but here!" "Dr. A, [...] are simply the best!"